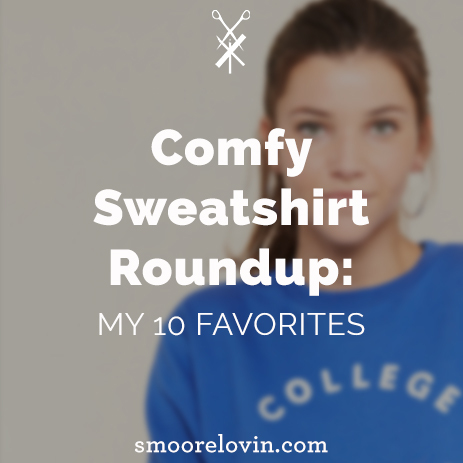 In honor of the weather behaving appropriately, I’ve put together a roundup of my favorite comfy sweatshirts (or jumpers if you rather.) Now that there’s a little chill in the air, the first thing I want to grab on a lazy day is something snuggly. Actually – let’s be real – the first thing I want to grab on any cool morning is something snuggly. Lately I go for my favorite comfy sweatshirt and a pair of Uggs I have had since my junior year of high school. Yes, they are as gross as they sound, it’s been 10 yrs. I’ve gathered some of the best sweatshirts I’ve seen around the interweb for you to browse :D. I can totally see myself curling up on the couch in these babies with something warm to drink and a good book. The other great thing about the sweatshirts I’ve chosen is they are just as good for the lazy, but active, days as they are for lounging. You can easily throw them on to wander through the city exploring new shops, or you can wear them to hang at your favorite bar for the afternoon with your partner and some friends. I am a big fan of items that pull double duty. There’s a mix of graphic sweatshirts with a 70’s vibe and cool cuts (like #10.) Everyone loves a good graphic tee, so why not a graphic sweatshirt layered under a bomber jacket and scarf or a cool collared shirt? If you aren’t a big fan of graphics or patches, the hemline of #9 and the elbows of #10 are an easy way to make sweatshirts exciting again. More importantly, I need to know what you are watching while you snuggle up. I have made my way through at least 90% of Netflix and need recommendations! So cute, right?! So versatile too ?